not seen before in the US. And the edit mode is just astonishing for a portable as well. The Fire Pro series is one of the most critically acclaimed wrestling series in Japan, and has been around for over 10 years. The series of games never had any flashy 3-D graphics, but is famous for its popular game engine, and surprisingly in-depth features. Only one Fire Pro game made its way to US shores before, and it was about 10 or 11 years ago, and it was under the moniker of Hal Wrestling for Game Boy. Now Spike has been the one in charge of releasing the Fire Pro games in Japan, but they never had US headquarters, but the great folks at Bam picked up the licensing rights, and managed to translate the entire game in time for the US launch for Game Boy Advance. 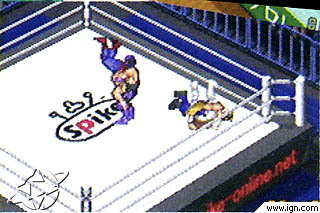 Now the graphics in this game are your standard Fire Pro graphics, which are a 2-D, 3/4 view of the ring. The wrestlers, however, look very NES 8-bit, but its good 8-bit. The ring looks just like any old regular ring complete with ropes, turnbuckles, and ring aprons. Now matches in this game that requires different type of arenas, like and Octagon that looked that it came right out of the UFC.. The wrestlers in the game are surprisingly detailed well for their small size on the portable screen, and there features are easy to distinguish and you should never get mixed up in the heat of battle of which wrestler you are controlling. The action in the game never slows down one bit, nor does it start to flicker, even with 4 wrestlers in battle at once. The menus in the game are easy to browse through, and you wont be getting lost at all. My only complaint is that the games visuals couldve received a 16-bit make over, and a little polishing off, because I do believe the Game Boy Advance can pull off better visuals than this. All right, we all now the sound for Game Boy games are bad, but we hoped that the GB Advance could pull off better music and sound effects. Well, in this case, theyre slightly better than most portable wrestlers, but still arent all to spectacular in general. The game has several background tunes you can choose to hear from during the matches. There are also over a dozen tunes the wrestlers come out to for their entrance music. Since there are so many wrestlers in this game it comes to no surprise that many wrestlers share the same entrance music. The sound effects are pretty standard, your basic sets of bleeps and other weird sounds for all the wrestling action. The only part of the sound I think they used to take advantage of the hardware they included in the game was the ref counting the pins, and making several other various calls throughout the bouts, and the realistic audience reactions in the game. The controls in Fire Pro are unique, and I havent seen them in any other wrestlers on Game Boy before. Instead of pressing buttons to initiate a grapple in most other wrestling games, all you have to do is walk right next to the other wrestler and you start to lock up. And to do moves, you press a button combination (like A and Up, or B and Down, for example) and youll pull off a move. But you have to press the combination at a precise moment, or if you press the buttons too fast, or too late, youll be on the receiving end of the move. Also, I believe this is one of the first wrestling games on Game Boy where I saw that reversals occur. The game engine in here incorporates a lot of other mechanics that the current console games feature also like double team moves, submission holds, and even the series trademark feature, Criticals (one-blow knockouts). All the wrestlers have different types of styles as well. You can have wrestlers that specialize in submission holds, cheap tactics, aerial maneuvers, and so on, and a majority of their moves will be under the category you pick. The game mechanics are so vast, youre thankful that the games instruction manual covers them well. You just have to make sure to read and understand it before you hop into the game, or else youll be in for some trouble. The game has a good variety of modes to choose. First you have the exhibition mode, which has 4 different sub modes. First, theres normal one-on-one matches. Then there are the death matches, where you wrestle in a cage, and whenever you whip your foe onto the side of the cage, they receive an electric shock. There are also several big drums surrounding the ring that will explode after a set time period which will damn near kill the wrestlers. The next sub mode is the Gruesome mode, where you fight in an Octagon, and you can only win by submissions. This is pretty much the whole UFC in one game mode at your disposal. The last sub mode is the battle royal mode, where up to 4 wrestlers battle at once. You can choose to have the elimination style set to over the rope elimination, or to standard pin/submission elimination. The next game modes are League where up to a total of 64 wrestlers wrestle in brackets in a point system where you get so many points winning, losing, etc. The next mode is tournament, where you can have up to 16 wrestlers wrestle in a King of the Ring type elimination tournament. We then have a 5-on-5 mode. Which is a spin off of Surivor Series elimination type matches. Where teams of 5 wrestlers go against each other. The first team to eliminate the other team of wrestlers wins. 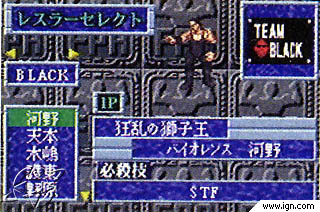 The next mode is Audience Match, which is the main single player mode. Where you wrestle a series of single matches and you have to appeal to the audience using lots of fancy maneuvers to wow them, instead of using cheap moves to win. This mode is used to unlock other wrestlers in the game. The game has an extensive edit mode. Where you can edit or create up to over 60 wrestlers. In the edit mode you can distribute skill attributes, adjust your wrestlers style, and go through the in-depth move editor, where you can adjust one of many moves your wrestler can do. You can also edit the names and logos of the organizations in the game, and trade wrestlers so you can mimic the current leagues like WWF, WCW, etc. The games battle royal mode also is game link compatible where up to 4 players can play at once with 4 game packs. For wrestling fans hoping to just come on in and start playing this game expecting to master the control in a matter of minutes, you should go elsewhere. This game requires a deep learning curve, and will take longer than usual to get these controls down. But overall, this game is really impressive, and youll be playing for hours to get yourself familiar with all the wrestlers and game modes available.